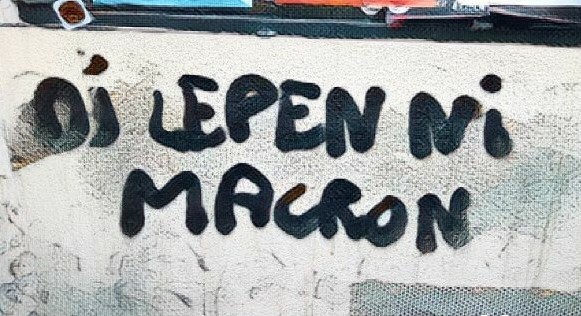 Image: “Ni Le Pen ni Macron” [Neither Le Pen nor Macron], Paris 2017, by Denis Bocquet, used under CC BY 2.0. Edited. In France, the unexpected and seemingly decisive victory of Emmanuel Macron’s La République en Marche! (The Republic on the Move!) and its allies, first in the presidential race, and then in the June parliamentary elections (winning 350 seats out of 577), means that the government is settled. But the political situation remains fluid and unsettled. In our electoral system, the president exercises decisive power when his party has the majority in the Parliament. On three occasions since 1958, when this was not the case, real power has been in the hands of the Prime Minister. To be elected one needs to obtain more than 50% of the votes in the first round of voting; otherwise there is a second round in which the candidate with the most votes is elected. Such a system favors a two-party system. For 50 years, political power has alternated between relatively stable coalitions, each being led by a major party: On the left, the Socialist Party (PS) in alliance with the declining Parti Communiste Français (PCF; 20% of the votes in the late 1960s, 2% today) and the small Green Party; on the right, Les Républicains in alliance with the small center-right party UDI. Despite its growth since the 1990s, the extreme-right xenophobic party Front National (FN) has not been able to shake this system. Given how the electoral system works, the FN’s ability to do well in elections (with between 10% and 20% of the vote) did not translate into parliamentary representation. From 2012 to 2015, it had only two members in the Assembly. Similarly, in 2012, a leftist coalition (Front de Gauche) led by Jean Luc Melanchon received 11% of the votes, but only had ten members in the Assembly. For two decades, France, like other countries, has been experiencing a crisis of representative democracy. Electoral participation in all elections has decreased (except in the presidential elections), especially for the working classes in the impoverished rural and deindustrialized areas where the cultural influence of the left is declining and that of the extreme right is growing. Following the mandate of Les Républicains’ rightist/nationalist Sarkozy (2007–2012) and “socialist” Hollande (2012–2017), the political crisis has deepened. Hollande was so unpopular that he did not even try to run for reelection in 2017. The established parties feared that FN’s Marine Le Pen would be a formidable candidate in the presidential race. It didn’t turn out this way. Faced with an increasingly alienated electorate, the major parties decided to involve citizens in the designation of their presidential champion by organizing “primaries.” The result was a success for left and right “radicals”: Les Républicains chose as their leader François Fillon, who was supported by the local Tea Party–like movement Sens Commun (Common Sense); and for the socialists, the leftist Benoit Hamon prevailed over Hollande’s Prime Minister Manuel Vals. Meanwhile, Jean Luc Mélanchon decided to go alone and created his own movement, La France Insoumise (FI, Rebellious France), while François Hollande’s Minister of Economy, Emmanuel Macron, decided to leave the Government and create En Marche! Macron is a product of the École Nationale d’Administration (ENA), the elite of the French civil-service, a former consultant at Rothschild Bank, then a member of President Hollande’s team and later a member of his cabinet. His politics resemble a mixture of young Bill Clinton and Justin Trudeau, with a touch of Tony Blair. Macron was shrewd and lucky. He attracted part of the rightist electorate that feared the reactionary program of Fillon and part of the leftist electorate that feared a choice between “right extremism and extreme right” (Fillon vs Le Pen). In the first round of voting, Macron came in first place with 24 % of the votes (8.6 million voters). It wasn’t a tremendous victory, but in the second round he increased his support to 12 million, the choice of an electorate that voted either for a lesser evil or for a defense of the European Union. Macron’s government includes politicians from Les Républicains (Prime Minister Edouard Philippe and economic ministries) and the socialists (Ministry of Interior and Foreign Affairs), the small centrist MODEM party, and technocrats (often young and often women). It will be pro-business and free trade–oriented, and it will continue to attack labor unions and the welfare state. It proposes to make permanent restrictions on freedoms previously introduced under the umbrella of an anti-terrorist “state of emergency,” including limitation on the right to demonstrate, less controls on the judiciary, and an extension of police powers. Although Macron reacted immediately to Trump’s withdrawal from the COP21 Paris treaty (“Let’s make the Planet great again”) and nominated to his cabinet the very popular Nicolas Hulot, icon of the ecologists, there is no evidence that there will be a strong environmental policy, and the nuclear and agro-industrial lobbies are well represented in the government. It reaffirms a commitment to increasing military and defense budgets. It will promote a Franco-German alliance to lead and defend the European Union. Macron has presented himself brilliantly on the international stage, using all opportunities immediately after the election to display his presidential stature at the NATO and G7 summits. After the elections, the rightist Les Républicains is in deep crisis, with its seats in the Assembly reduced by more than one-third. It is divided between hard-line conservatives and soft liberal-democrats. The Front National is similarly divided between social-nationalists and conservatives-nationalists. But the situation is far worse for the Socialist Party, which has gone from 290 representatives in the Assembly in 2012 to only 44 in 2017. The survival of the PS is in question. The decline of the PS might have been an opportunity for the “left of the left,” but Jean Luc Mélanchon and FI candidates engaged in a bitter fight with other leftist candidates, communists, greens, and left-socialists. The result was catastrophic for the left. The situation was aggravated by a significant increase in abstentionism from the parliamentary elections, primarily voiced by young people and the working classes. More than 50% of the electorate refused to vote, something never previously seen in France. There were seven million votes for Melanchon in the presidential race, but only three million for FI and the Communist Party in the parliamentary elections. On the right, the FN suffered a similar fate, receiving only three million votes. In the coming years, we can expect a profound political restructuring in France. Social and cultural conditions cry out for new kinds of leftist parties. Hamon’s and Melanchon’s presidential platforms, supported by 27% of voters, took strong positions on social policy, civil liberties, and ecological issues. But La France Insoumise, as it is constituted today, cannot unleash this political potential because it shares with Macron’s En Marche a hierarchical structure through which candidates for elections are selected. For the time being, Macron and his government will have full power, despite lacking support from a majority of the electorate. It will take a new kind of politics and organizational forms to challenge the new status quo. * Bernard Dreano is Chair of the International Solidarity Studies and Initiatives Center CEDETIM, Paris.